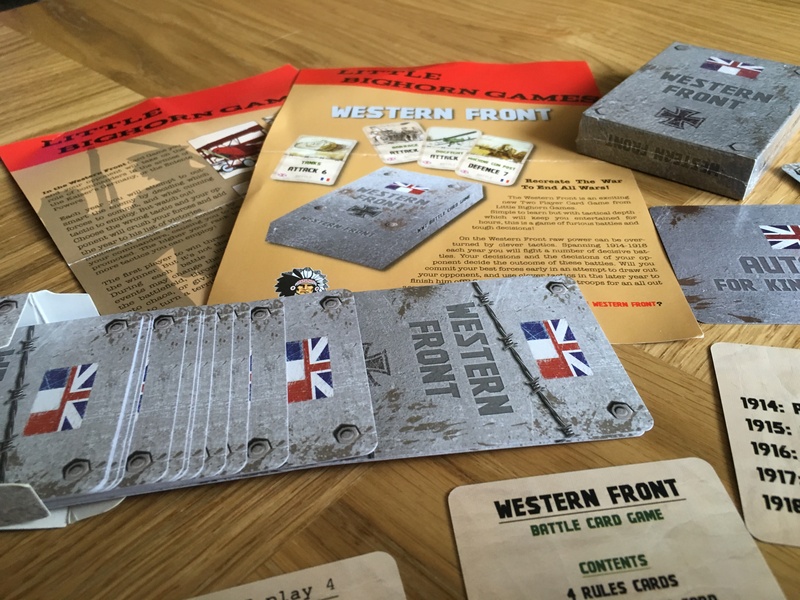 This year at Tankfest 2016, I came across a small display where two brothers were showing a simple card game. 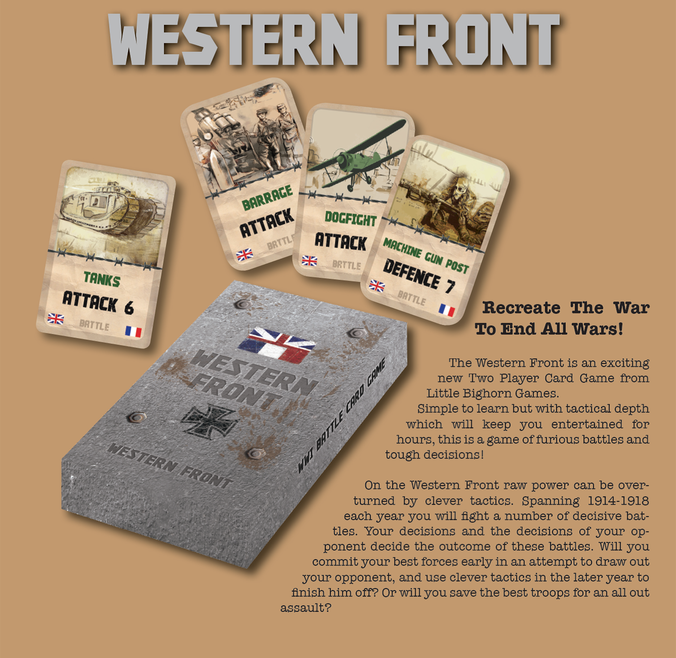 The game was called Western Front and it’s a game about World War I. The inventor of this game is one of these two brothers and his name is Tom Lee. Since his childhood Tom as been passionate about games, believing that good games should fuel the imagination as well provide challenges for the players. 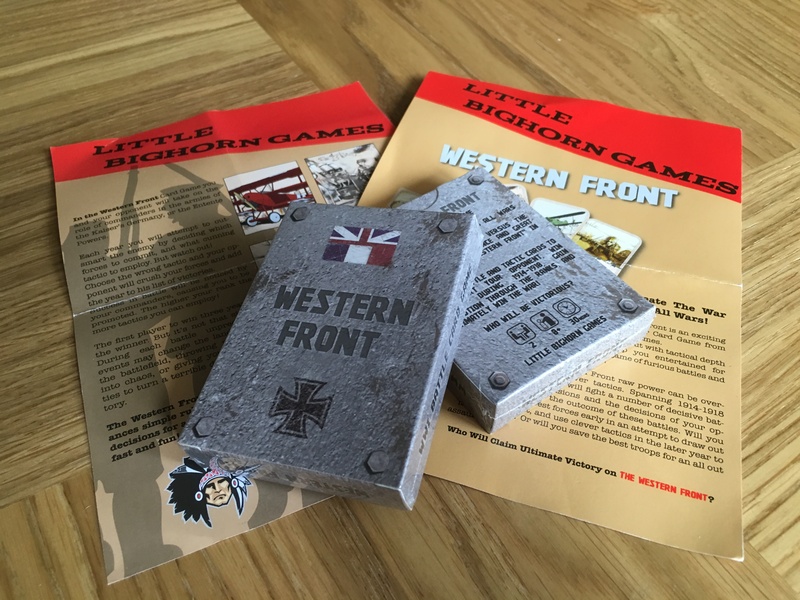 So in 2016 the Little Bighorn Games was born and his first game Western Front just came out this month. What caught my attention was the smiles on their faces, a table with the game laid out and my interest in board/card games. Something said to me that I should stop and had a look at this. I was quickly introduced to the game and it I was sold straight away to it because of the fact that it’s a “fast card game”. The game is designed to last up to 30 minutes. The idea behind this is, if you are together with a friend and got a few minutes free, you just want do play a quick game and not stay there for hours to finish. When me and my good friend Ben started talking with them, we where drawn into the game and gained interest, both because it seems interesting to play and also because we felt the need to support this project. Me personally I got a brother who is studying to be a Game Designer and Developer, so I can understand the passion that one person can have to create a game and how difficult can be to sell it to the players. I haven’t played it yet, planned to do it this weekend, but I couldn’t let this game go without a post and try to support it even more. Both Tom Lee and his brother were very nice and very caring that we understood the game and making sure we would have fun playing it. If you guys want to give them some support or if you think you might like this game and want to buy it, just visit their page and store at littlebighorngames.com. The game costs 8£ plus 2£ for shipping. Players will fight 7 battles attempting to win the current year. 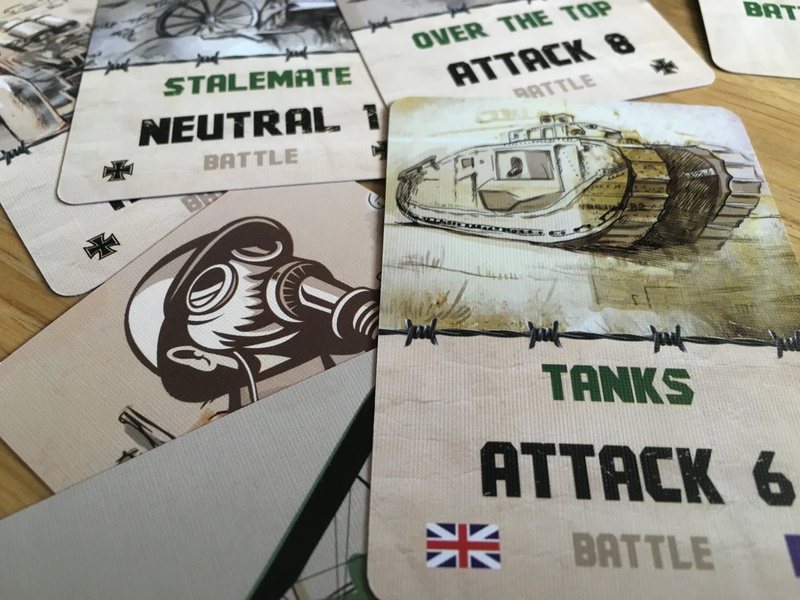 Battle cards are revealed next, and players then work out their final score. Finally if you played a tactic card, apply any bonuses to reach your final score. Once used it is discarded until the following year. 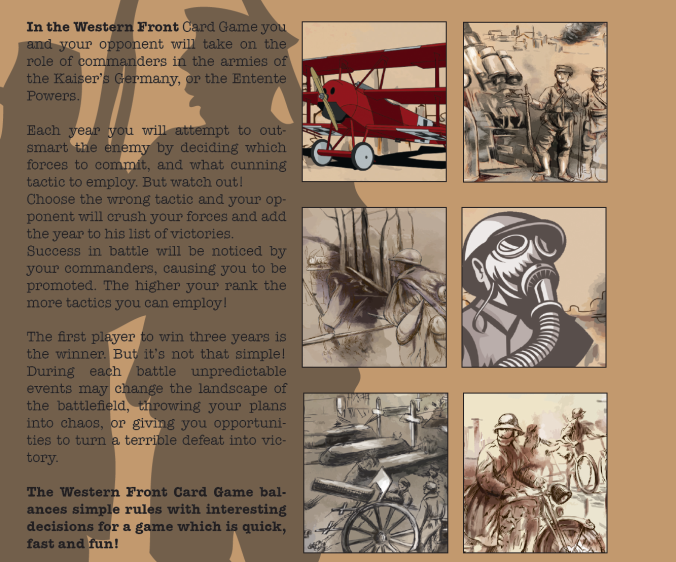 If both players have previously reached the rank of General, you may choose to begin the game with all 5 tactic cards. Determines the number of tactic cards a player may choose at the start of each year. Symbolise various struggles and often unexpected situations soldiers faced during the war. Represent the 5 years of conflict during WWI from 1914 to 1918. Auto-win cards cannot be countered by the opponent’s Auto-win card. 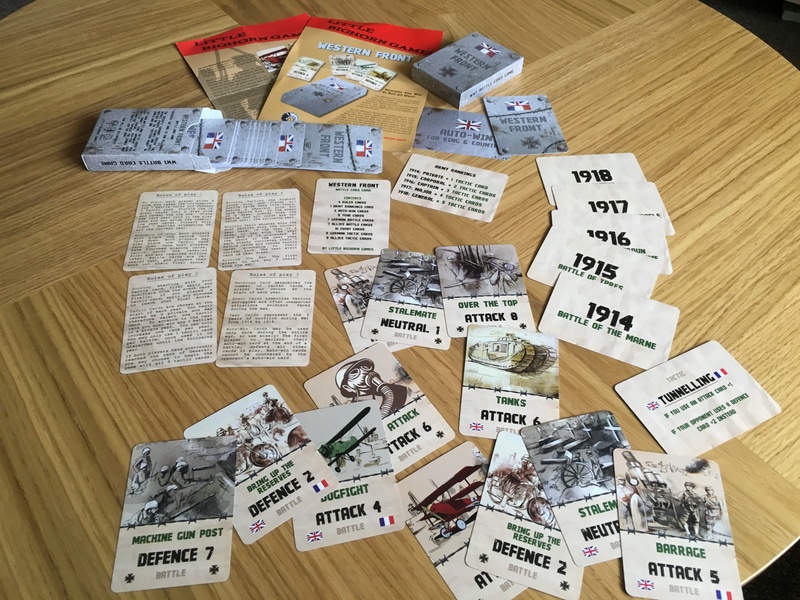 In the event of a draw, nobody wins the battle and all cards are set aside until the next year. At the start of the next year each player retrieves their 7 battle cards and chooses tactic cards according to their current rank. The first player to win any 3 years, wins the war! Let me know what you think on the comments. Seems to draw the player in, with the fast pace of the battles, and enjoyable!